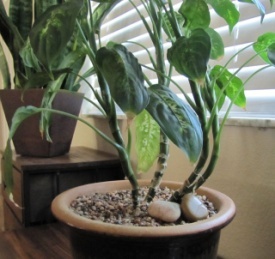 I have a dieffenbachia (dumb cane) that I’ve raised from a 2-3″ sprout; now it’s about 5-6 years old. It’s only been repotted once, several years ago. About 6 months ago, we moved from a dry, high altitude climate (where I’d purchased the plant from a Home Depot) to a sea-level, much more humid climate, but the plant is always indoors and seemed to come through the move well, not even wilting along the way. I always water with distilled water, nothing more. Lately I’ve noticed the stalks really leaning and tipping over, however. The entire plant is only 20″ tall, so I have a hard time thinking it’s too top heavy – two of the four stems have gotten a curve in them, and if not for some river rocks I have propping them up (see photo), they’d nearly be resting on the edge of the pot – for years they were all straight. The other stems are also starting to lean, and I’m concerned by how rapidly this is occurring. I’ve had very few problems with this plant over the years – the worst was fungus gnats, and now the top 2″ of the pot or so are gravel and sand, which has eliminated them. There are the usual old leaves yellowing off and a few brown tips, but nothing severe. The rest of the foliage is still lush and new leaves are appearing bigger and better than ever. I’m very attached to this plant and I’d appreciate any advice to try and save it! Please help! This is a common problem with all older Dieffenbachias that have never been pruned. On your plant, the leaves are relatively heavy for the thickness the the stems. New growth is always at the top, even as it loses lower leaves. So inevitably, the lower stems become bare and the weight of the upper leaves starts to pull the stems in one direction or another – usually in the direction of the light. As long as the plant is growing and adding new top leaves, there is no long-term way to prevent this leaning. Using stakes and stones to prop the leaning stems is only a stop-gap measure. The solution is to prune back the older stems, starting with the tallest one. Simply cut off that stem to a approximately 2 inches above the soil. Within a month or so, you will see new growth emerge from that stem just below the pruning cut. This pruning will eliminate the bare stem; it will introduce new growth lower down; and it will stop the leaning of that stem. A simple cut can accomplish so much! Any of the other stems can also be pruned back at any time. Pruning never affects the overall health of the plant, but it does affect the appearance of the plant. So don’t hesitate to do the pruning. The pruned off tops can be rooted in water or at the base of the existing plant. Fungus gnats are almost always a sign of the soil staying too wet. After you have pruned back the stems, I would suggest removing the pebbles and sand as they are keeping oxygen from entering the soil and allowing it to dry out properly. Allowing the top inch of soil to dry will not only benefit the plant, but it will also deprive the gnat larvae of the moisture that they need to survive. The local climate and humidity level will have no bearing on your indoor plants. Distilled water is necessary only if your tap water is hard. The pot size is already a bit larger than necessary, so I can safely tell you that it will never need to be repotted.